Workshop in which you will be led in detail the possibilities of movements for each joint complex and learn how to create bandha around each to effectively turn the yoga practice into pranayama and moving meditation and always gain rather than deplete energy, no matter if your favoured practice is athletic or restorative. This workshop is accessible to all levels with plenty to take away from the experience at any stage in your yoga journey. 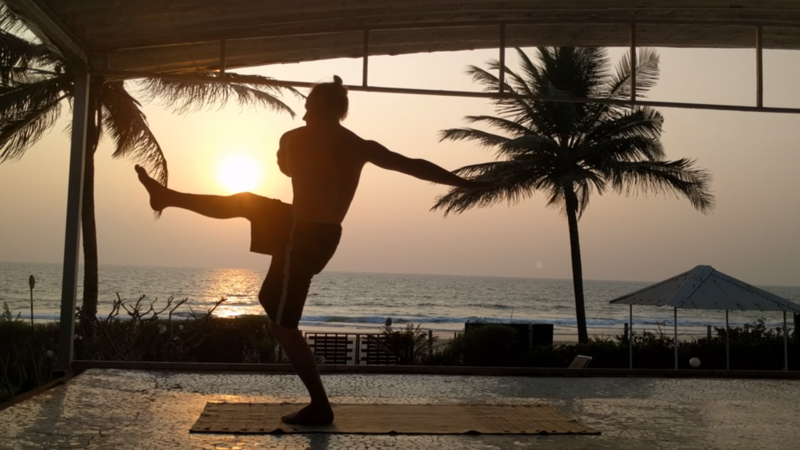 We will mainly focus on using rotation of the limbs to create stability around all the joints making this practice suitable and safe or everybody as well as highly recommended for teachers of yoga, pilates, martial arts and anyone who wishes to/ or do practice exercise based physiotherapy. How to effectively access the core throughout downdog, chaturanga and preparing for handstands & floating. We will practice simultaneously three approaches; therapy, boga and yoga. Addressing the fun challenging aspects of asana as well as therapeutic approach to the healthier approach. The first is self explanatory, learning to practice and teach in a safe effective way for most people, whilst using practice to heal or make the body even more healthy and to avoid injury in the future. Everything we practice is subject to ahimsa (gentleness) and svadhaya (self inquiry). Boga is commonly understood as yoga for sensory pleasure, and numerous people will be able to follow and practice in a way which leads to true yoga. A feeling of interconnectedness of the mind, through the body, union. The structure is mostly physical practice based, try this, try that, what do you feel? The emphasis is on pacing oneself, less stretch, less tense as we're practicing for a longer period than perhaps normal. The intention is that you will complete this workshop with a healthier stronger more flexible spine than ever! Perhaps more importantly than this, understanding why and how to recreate this healthy condition each time you come to practice. There will be handouts for you to take home with reminders of everything we learnt on the day. You can tick off your pass when you arrive at the first class that suits you, see you then! Please note this offer is intended for new students. If you have attended my classes or courses in the past and found yourself here, please accept one free class or 10% discount on the next workshop or course. More classes will be announced in the immediate future so please follow on social media, white list yogastef emails and please share with your network about this great offer! Fight or flight... or freeze? Have you ever thought "that wasn't like me" or "i can't believe i said that"? Do we always know when we're in the midst of a struggle? Or do we often unpick afterwards what was really happening during that moment of difficulty? Could we have been more reactive in the moment than we realised at the time? Thinking we arein total control of decision making is a common, or was a series of automated thought patterns really calling the shots? In the next few minutes you will learn how and why we get temporarily torn out of our usual thinking and into these peculiar uncharacteristic states. In every single moment, our mind is monitoring the situation for signs of threat. This is absolutely necessary for us as evolving beings but comes with the undesirable side effect of stress. Because this ancient part of the brain (limbik system, affectionately named as lizard mind) worked in this way, it got us to this stage of development, i.e. it stopped our ancient relatives getting eaten or killed long enough to pass on the genes. So obviously it has become a vital part of our genetics and survival to look out for threats and has remained an automatic function continuously pushing our buttons behind the scenes of our day to day experience. What's important for us to realise is that threats that are imagined have almost the same effect on our nervous system, and that a lot of them are being triggered even when we don't realise it. A guy sees something that resembles a snake and has gone into fight and flight running before he even has time to see that's it's just rope. Now we may sneer and think how reactionary he was but don't we all do this to a subtle degree? Perhaps we have a phobia or fear that we can't quite place the origin of however it prevents us from going to explore somewhere new or even just being comfortable in an environment where there is no immediate danger. Or more subtly, we may think a conversation is moving in a way that challenges our beliefs and that challenges our sense of well being, so we try to redirect what's being spoken of before we actually get to an important point that could help our understanding more. When our lizard brain recognises perceived threats, no matter how small, it begins to take a more controlling role in the experience and we move into creative shutdown. The heart rate begins increasing the pupils dilate, adrenaline begins to run through our blood and we get pumped for a fight, or ready to run for our lives, even when it's about something non life threatening, even non threatening, and shockingly, even when the trigger isn't real. And this makes decision making rash, and rushed. What makes things even more challenging is that fight and flight states are much slower to leave than they are to arrive, so when do begin this journey, it can feel like an uphill struggle, but as Ayya Khema alluded, if we only just learnt how to clean a house after living in it for many years, we'll be buried when we first begin to tidy up. This isn't a very nice place to be. I've felt it more times than I care to have, that like a freezing blender just switched itself on inside my stomach and the head feels too small for the brain all of a sudden so I start to feel my heartbeat in my eyeballs. Perhaps even just the vivid description of fight and flight I mention here brings you a sense of it, or maybe it was enough to trigger it in your own body. And how about this? What if we have actually come to enjoy this state? Let's have a look at some popular stimulants, coffee, nicotine, they produce the fight and flight symptoms without even having to have the cognitive triggers! Why would we like it you ask? A deeper examination is for another post or two, but for simplicity, lets say for now, we like what's familiar, it has some comfort even though it's not always ideal. We have created a culture and society that operates under the illusion of fight and flight being the productive state, and stopping to consider any other way... well there just isn't time for that is there? Well, the old Buddhist axiom, those who don't have time to meditate, need it the most. Our ambition makes us blind. Blind to the plain simplicity our body is often screaming out for us to listen to it. For the most part we do, we take a stretch when we feel really tight, or we go for a bit of fresh air or even a less clean stimulant when we would like to refresh our attention. However, why wait until we absolutely need these things to react, can't we learn to be more proactive, preventative or tiresome states before they even warrant a remedy? Can we be more efficient, awake, ready without even having to set aside extra time to do it? So to remedy this wild ride of symptoms into a friendlier harmonious balance and self control, I'm putting forth the practice of mindfulness (that's the bodily awareness kind as taught by Jon Kabat Zinn). Because as we get more comfortable in the stress state, as we recognise what's pushing our buttons we can be pushed around less by our lizard brain and make better informed choices. And the best thing is, once we've taken time aside to learn how to be more mindful, it becomes automatic. A new self regulating background process that actually moves us away from stress states. When we learn to be more mindful and in tune with how the limbik system is working for us, not against us, we don't even need to remove threats to be peaceful and tranquil amongst them, whether real or otherwise. We can be happier and more productive people, better workers, family and community members and even help out others who haven't had the good fortune to recognise they're caught in a perpetual fight or flight state. We can start to reform habits which let us see life as nourishing and comforting more and more, and less and less like a challenge or a series of battle we must undertake. We don't need to fight to stay on the winning side.